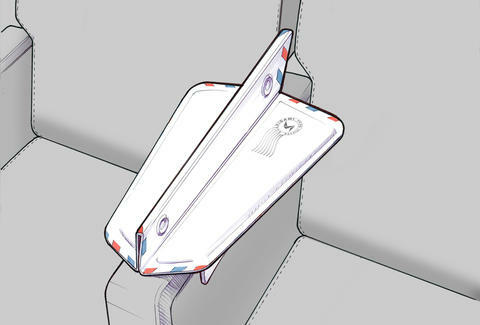 This clever gadget will end the armrest wars -- forever! Overhead bins. Reclined seats. The armrest. If a brawl breaks out on an airplane, there's a good chance it started over one of those things. But when it comes to the armrest, things don't have to get so heated; at least not if everybody packs their own Soarigami: a clip-on, origami-style armrest divider that looks like a paper airplane and frees up twice the space of a regular armrest. Twice the space!!! Not only that, the super-compact device (which was developed with the help of Silicon Valley-based firm Focus Product Design and is made from neoprene and plastic) folds completely flat, so it fits easily in your carry-on bag. Look at those two handsome illustrated passengers peacefully coexisting. It's a dream. And unlike similar, tiered products, the Soarigami's got a vertical divider to ensure arms don't accidentally brush, at all. Okay, maybe a little bit. The only problem with this bad boy? It's still being tested and doesn't debut until early 2015. That said, you can pre-order yours here for around $30. 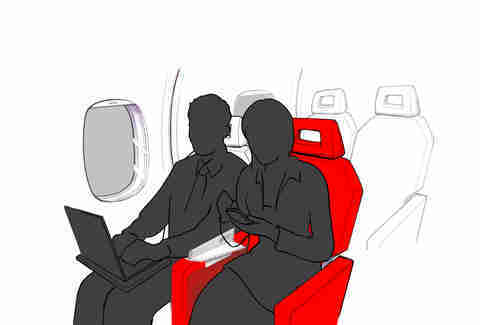 Until it arrives, though, you'll have to resort to old-fashioned methods of scoring arm space -- namely, by offering your seat partner an Altoid and grabbing the armrest the moment they leave it unmanned.